With your work folded in half you will join your straps in the first round you made. You will count 5 (6, 8) sts, from the right side, and in the next st you will join your work with the same light color. Row 1: ch2, hdc in the same sp, hdc in the next 7 (7, 9) st, you will have 8 (8, 10) hdc in total Turn your work. Row 2: ch2, hdc in each of the 8 st across. 8 (8, 10) Hdc in total. Repeat Row 2 until your strap measures 4 1⁄4, (4 3⁄4, 5) inches, Do not Fasten off. Turn your work wrong side facing you, from the left side of the strap you will count 10 (12, 16) st and place your stitch marker, count 9 (9, 11) more st from the marker and place another, you will join your strap in between these 2 markers. You will either join your strap with a sl st or sew them together with a tapestry needle. I chose to do mine with a sl st. Line up your strap in between the markers and you will match stitch for stitch from the strap to the body and sl st your way along. Fasten off hide all loose tails. 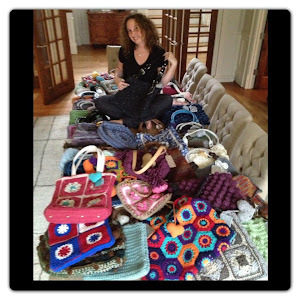 Turn your work back to the right side facing you and repeat the same steps for the 2nd strap. Skirt: Put your work with the straps facing down. With the same color as your top you will want to join your yarn at one of the stitches at the side of your work. 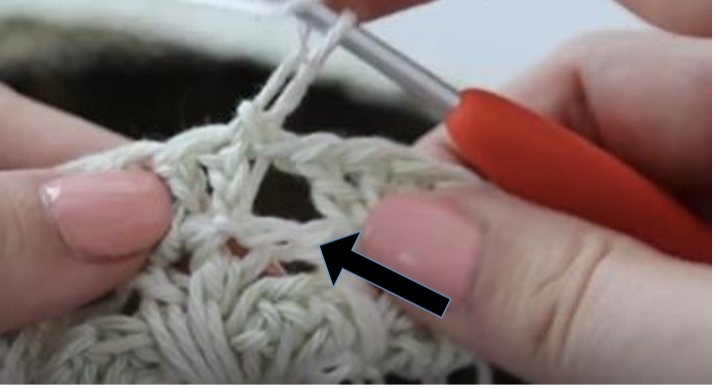 This next round will be an increase round, you will have 80, (104, 112) hdc you will want to increase to 105 (129, 138) st so you will increase 25, (25, 26) stitches evenly around. Round 1: ch1, sc around making sure to increase 25,(25, 26) stitches, sl st with the first sc. You will have 105 (129, 138) sc. Round 2: ch1, sc in the same st, *ch2, sk 2 st, sc in the 3rd * repeat from *to* around ending with a ch2, sl st with the first sc you made. Round 3: Join your next darkest color (Do not fasten off the Main color you will pick up again in the next round and every other round), ch4 (counts as first dc and ch1), *in the next ch2 sp make 3dc in it, ch1* repeat from *to* around sl st with the first dc you will make 2 more dc in that ch 2 sp, sl st with the top of the 3rd ch, join your Main color yarn leaving the 2 nd color in the back of your work you will pick it up in the next round. 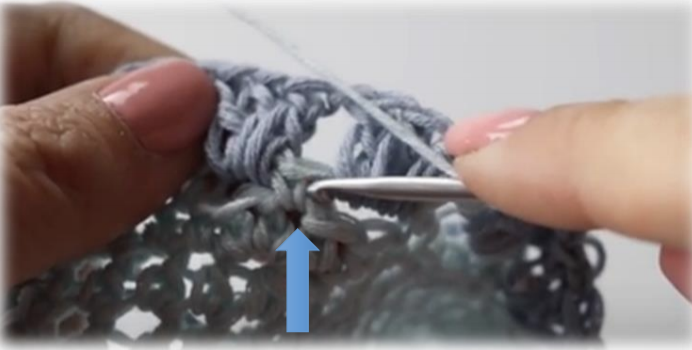 In that space you will make a V stitch (dc, ch1, dc), you will repeat that all around making a V stitch in the space between V stitches from Round 4, sl st with the first dc. Rounds 7-10 (7-12, 7-14): You will repeat Rounds 5 and 6 At the end of Round 10, (12, 14) fasten off the 2 nd color yarn, keeping the Main color attached, you will use this throughout the dress. For the next section you will Join your 3rd color yarn and continue in pattern. Rounds 11-20 (13-24, 15-27): Repeat Rounds 5 & 6, for this section you will be switching back and forth from the Main color and the 3rd color not the 2nd color. Note: If you run out of the Main color, no worries just use the rest of the next lightest color. For the next section you will Join your 4th color yarn and continue in pattern. Rounds 21-30 (25-36, 28-41): Repeat Rounds 5 & 6, for this section you will be switching back and forth from the Main color and the 4 th color not the 2nd color. For the next section you will Join your 5th color yarn and continue in pattern. Rounds 22-40 (37-48, 42-55): Repeat Rounds 5 & 6, for this section you will be switching back and forth from the Main color and the 5 th color not the 2nd color. For all sizes repeat Round 6, fasten off and hide all loose tails. You can leave your dress as is or work a Border around the free edge of the top of the dress. Border: Choose the color you want for your border, joining at the back of the dress at the neck edge, ch1, sc in each st across until you reach the first strap, you will work a sc in each side row of the strap, sc in each st of the front of the neck and sc in each row of the second strap sc until you reach the first ch and sl st with it and fasten off your work. For the armhole opening you will join the same color yarn you used for your neck edge border and join in any of the st of the underarm, ch1, sc until you reach the strap, sc in each of the side rows, sc until you reach the first sc, sl st and fasten off. Repeat for the other armhole opening and you are done. 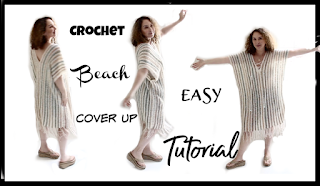 You have created this Moroccan Style Ombre Dress!